Hope Estate is perfectly located in the heart of Pokolbin, just two hours from Sydney. Hope Estate is the ultimate location for estate produced wines, fine dining, functions and is home to Pokolbin’s newest Craft Brewery. 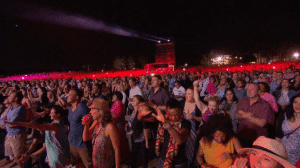 The Estate is also home to the Australia’s largest purpose-built outdoor concert amphitheatre that hosts an array of legendary international performers each concert season. Hope Estate is dedicated to making sensational wines, we are firm believers in estate-grown varietal wines. Following this philosophy, Hope Brewhouse craft brewery opened early 2015, with a broad range of beers & cider available on tap. Guests can view the brewing process while enjoying a tasting paddle and pizza in the Brewhouse Café. Our Cellar Door is open 7 days, visitors can enjoy a personalised tasting experience with our friendly and knowledgeable staff. Breathtaking views of Hope Estate’s amphitheatre and surrounding countryside can be experienced alongside a sumptuous meal from the deck of Harvest restaurant. 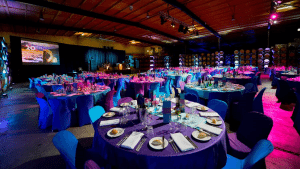 The Estate has a number of functions spaces that can cater for an intimate gathering to an extravaganza for a large crowd. The famous Great Cask Hall is one of the most impressive Barrel Rooms in the country, it’s also featured on the Television series “Farmer wants a Wife”. Our Cellar Door and adjoining Terrace area which flows onto the grass amphitheatre is the perfect location for pre-dinner drinks or an informal cocktail style event. 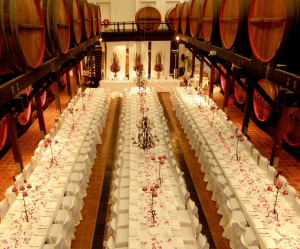 The multi-functional Winery space with a seated dinner capacity for up to 1000 regularly caters for large groups, has hosted award ceremonies, mini-concerts and a private car show. 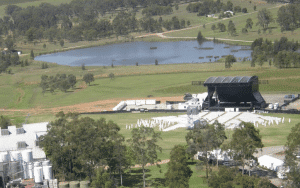 Our amphitheatre, with a capacity of 19,000, and surrounds is a blank canvas for events and an ideal location for film shoots, exhibitions, concerts and festivals. We invite you to visit and enjoy all that Hope Estate has to offer.